Elaine Adair Pieces: Still Kickin' -- just not too high! I'm still kicking, just aching and sore, wondering when my chiropractic adjustments are going to make me feel better, instead of 'run over by a sugar beet truck!" This project below is almost the sum total of 2 weeks of non-sewing. My daily naps, normally power naps of 5-10 minutes have extended to 2-3 hours!, then early to bed. Even if I have a spurt of energy, that long nap doesn't leave much time for pleasure sewing, does it? I'm working in the morning, which gives this sore body something productive to think about. This piece of fabric ended in my stash, but was difficult to use. 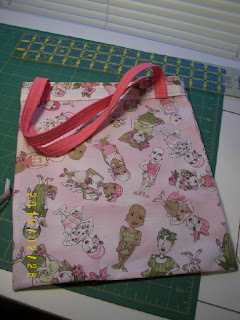 However, at last Guild, there was a 'call' for pretty cloth bags to hold papers, pamphlets, and information given to women patients visiting the Cancer Center, to help keep it all together, and so they know someone cares. Look at the poor overworked, bent-over guy! "Tote that barge - lift that bale!" I don't know why he insists on snow-blowing every space possible! -- Even the alley, as well as the whole block, and then comes in the house, complaining like a XXXXX, and conking out for the rest of the day. This was last Sunday - a beautiful snow and not too cold. 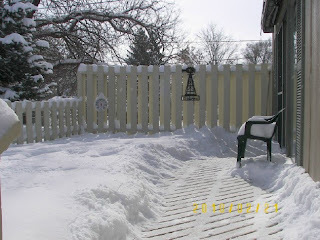 And the last photo is my once-pleasant deck, complete with the Welcome Sign. Funny! Look how deep the path is. Overall, we had about 12 inches. Wow, looks like 'ol man winter found you again. Hope you feel better soon! Sure hope you get to feeling better soon - not fun to ache and have pain. I hope that you feel better soon. I have had many problems with shoulder and neck pain. I tried muscle relaxers, chiropractors.. and the only thing that ever helped is deep tissue massage. I went to a local fitness center and it was pricey, something like $60.00 for an hour. I only did a half hour and had her concentrate only on my neck and shoulders. It only took around 3 sessions and I felt better. Sorry to hear that you are having problems with aches and pains. Never fun. What you need is a bit of warm sunshine. Don't we all. I have a neighbor like that. At the first hint of a snowflake he's out with his snow blower. 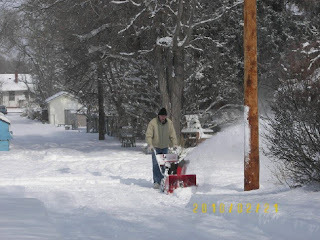 Hmmmmmmm, I wonder why he doesn't come do the end of my driveway.....there's always plenty of snow. Guess neighborliness only goes so far. constant pain sure saps your energy. From the person who took ANOTHER nap today! Sorry to hear you are having 'Ouchies'....hurry...get better soon! I sure hope you are feeling better soon! I'm poppping over from our quiltville yahoo group. I love your Loralie tote bag. I just love her fabric. Anyway, just wanted to encourage you, so sorry you aren't feeling so great. Hopefully that road-kill feeling will go away soon. I just want you feeling better. Prayers for that!!! Your husband is so like mine...getting it done. I grew up near a sugar beet factory, that was a fun memory...beets go in, sugar comes out! I hope you start feeling better soon! 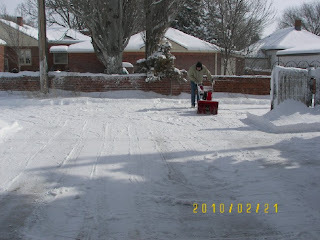 When we get snow, my hubby thinks every inch of our property needs to be cleared. Only he uses the tractor. Men! What a fun bag you made. That's something! Dang that you continue to struggle with this pain. Hard to bring out the best in a girl when this sort of thing is going on but, from what I'm reading here, you're doing a pretty good job! I love seeing your deck. It's such a change from when you were posting about it this summer, isn't it? hee! Oh, I feel your pain. I hope you won't be feeling it soon. My simple exercises really helped me. I do hope your treatment helps ASAP. I hope you'll be better soon. It's amazing how pain runs us down. I got a giggle seeing that photo of your husband snowblowing the yard. My dad used to do the exact same thing! He said it was to keep water from getting into the cellar-which never happened, even when it rained. I think he just enjoyed playing with that toy!